The good people over at BrewDog have outdone themselves. The left some of the beer from their first batch to age for 12 months in a single Bowmore 1968 cask. They bottled this in April, but you don’t have much hope to get your hands on this one, as only 200 bottles were made. Thie Anniversary Paradox comes with a specially designed label and a certificate of authenticity. 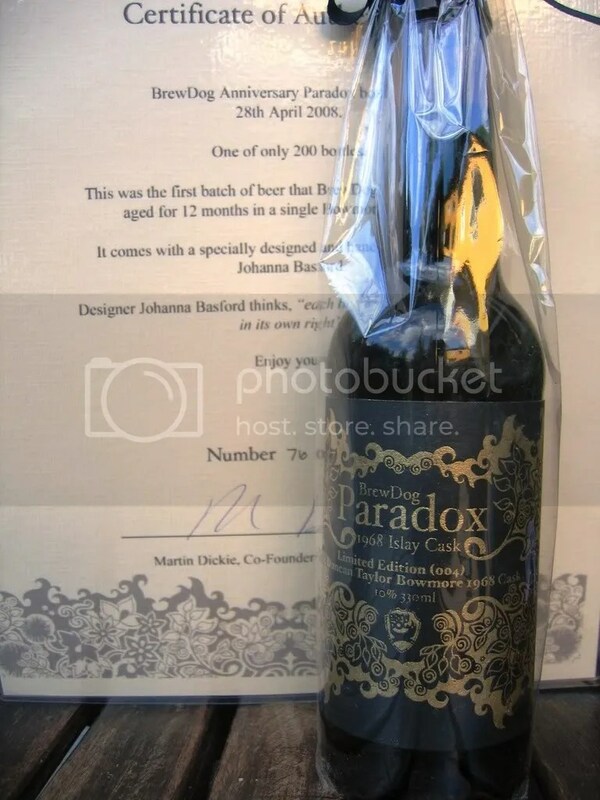 Your best bet would be to try to get a bottle from the Swedish Systembolaget, where the beer is released in Mid-July, probably a few bottles each in their flagship stores in Stockholm, Gothenburg and Malmö. They charge 480 kroner for this – about 60 Euros. As for me, I got a package from the brewery. The customs declaration said Yeast sample for analysis, which is stretching it a bit, but not totally untrue. I’ll keep this in the cellar for some weeks, and I’ll let you know how it tastes.